Yes, that’s a reprinted Classic Space torso. Oh, and note the “Vol. 1” in the corner. Sweeeeeeeettt!!! Not much else to say besides w00t! Vol. 2 has to have a castle minifig. Now that you mention it, I’m quite surprised there’s no castle figs in here. Too bad a castle one won’t have the really old-school helmets. Gotta Gotta Gotta HAVE IT! 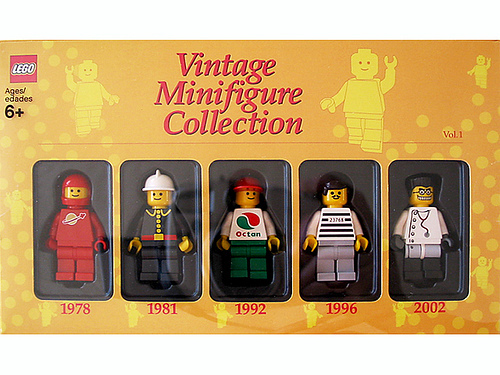 A collection with vintage space minifigs in all colors would be awesome. I think I’m getting dehydrated from drooling. Did anyone else notice that the helmet on the classic space fig is not the classic helmet? Other than that I am really excited about where this is going! I can see Lego doing an all space set, an all castle set, etc. Didn’t they used to do that way back in the day? Memories…. Funny thing is, the only one of these guys I’ve owned is the fire chief. And that was a thrift store find. All I hope is that these come out a a LEGO store and not only LEGOLAND. Beautiful! They couldn’t make new torsos for the Space Factory sets because torsos cost too much, but they can for this? I think LEGO just lied to us about that like they did about the whole color change thing. Plus this will most likely cost $10-$12 which once again is way too much for just a few minifigures. though all of these fig’s are easily obtainable in their original form for a reasonably cost. As debated all over the interweb, i find the choice of fig’s to be a little questionable. Bring on the Paradisa females in further volumes of this series Lego® and you may just win my praise…..
I’m with Yoko…it’s nice for collectors, but I don’t collect. *shrug* It’s not something I’ll probably end up getting, but I hope the real benefit to me is a sudden flood of say wild west or pirate figs on Bricklink which would drive the prices down. On the other hand, if they released a set of just pirate figs or wild west, then I’d be all over that kind of set. That fig was always a faviourite of mine! $10-12 is optimistic I think. The 5 packs of skeletons or knights, minifigs that are current and not particularly collectible, sell for $18 where I live. Lol, if you put the fireman torso with Hitler’s(prisinor’s) head, you have a Nazi officer. Oh and the C-space helmet is wrong. Yes, they haven’t made that helmet in 20-25 years. Pike, what country do you live in? The Castle minifigure sets are $12-$13 USD. The castle figure sets are $17.99 here in Canada – even though $1 CAD = $1 USD these days. Same with all other lego -> $99 USD = $139 CAD. I asked a lego rep when it was going to be balanced and she said soon – but not the way we would like – US price were going to go up. Love the mad scientist.Hope they make one with a starwars figure in it. how much do u think it will cost?